Auggie was our first Chartreux. He was originally obtained as a companion for our Norwegian Forest Cat, Java. They became great buddies especially when traveling to the shows together. Auggie became a great show cat in his own right and actually achieved a higher International Ranking than his buddy! 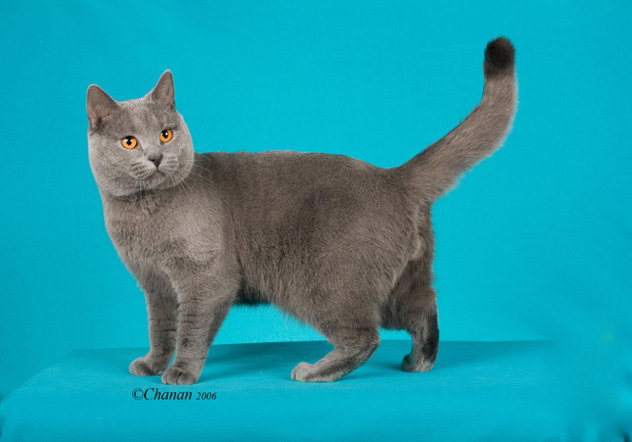 Auggie stole our hearts and because of him we fell in love with the Chartreux Breed. Many exhibitors still remember seeing Auggie lay his head against my cheek and nuzzle me each time I carried him back to his benching area from the show ring. He truly enjoyed traveling to the shows with us. What an amazing cat! There will never be another quite like him. Thank you Nancy for entrusting him with us! We treasure every day with him. Sound Credits: “Milord” by Edith Piaf. Use the video controls below to adjust volume or turn off sound.